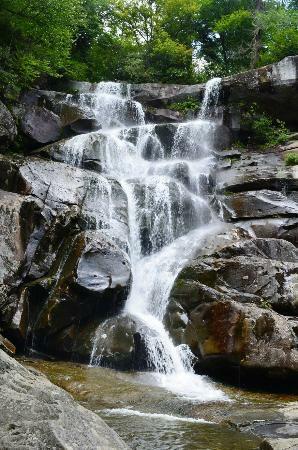 Ramsey Cascades are the tallest and most spectacular waterfall in the Great Smoky Mountains National Park. At over 100ft high, water from Ramsey Prong pours over rock outcroppings and collects in a small pools below perfect for cooling tired feet during the Summer. At the base of the falls you can see many varieties of Salamanders enjoying the mist and sun light. The Smokies are the Salamander capital of the world with of 30 species. The hike to Ramsey Cascades is very beautiful. You will follow along Ramsey Prong Creek on an old roadway for 1.5 miles. The road turns to trail near the confluences of Ramsey Prong and Middle Prong. At this point the real treat begins. 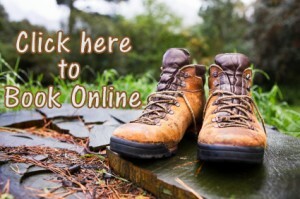 You will hike through the Largest Old Growth Forest left inside the national park! This area was spared just in time from the devastating logging operations with the establishment of the national park. Record sized Tulip Poplar, Yellow Buckeye, and Eastern Hemlock stand just as they did hundreds of years ago giving you a sense of what this land looked like before humans ever stepped foot in the Smokies. Difficulty rating: Moderate to Strenuous, 2,375 feet of elevation gain.